Advanced energy storage promises to play a key role in modernizing our nation's electricity grid to enable the integration of increasing amounts of renewables, improve operating capabilities, enhance reliability, allow deferral of infrastructure investments and provide backup power during emergencies. While batteries may soon provide short-duration energy storage at reasonable costs, they do not perform as well for longer durations, for example multi-day storage. One alternative is power-to-gas technologies, such as water electrolyzers that convert electricity to chemical energy in hydrogen (H2), which can then be stored in pressurized tanks. These approaches provide excellent longer-term storage at a lower cost, but suffer from poor roundtrip efficiencies relative to electrical energy storage in batteries. The same set-up can also be run in reverse, as a fuel cell or flow battery, to turn the hydrogen into electrical energy. By creating a dual-mode system, the overall cost of the system could be drastically reduced. Proton Energy Systems will develop a hydrogen-iron flow battery that can generate hydrogen for use and energy storage on the electric grid. This dual-purpose device can be recharged using renewable grid electricity and either store the hydrogen or run in reverse, as a flow cell battery, when electricity is needed. The team will develop low-cost catalysts to use on both electrodes and leverage their expertise in system engineering to keep the costs low. By using two highly reversible single electron reactions, the round trip efficiency could exceed 80%. By operating at much higher efficiencies than traditional electrolyzers, this technology could offer multiple value streams thereby enabling widespread adoption of distributed storage and hydrogen fueling. 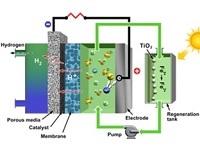 If successful, this technology could yield greatly improved water electrolyzers, which could enable low-cost energy storage compatible with intermittent renewable energy sources, such as solar and wind power. Storing energy from intermittent renewables over long durations in a cost-effective manner could reduce demand on the electric grid, while produced H2 or derived liquids could provide a low-carbon alternative to fossil fuels for transportation. Clean energy storage technologies could allow high penetration of emissions-free renewable power. The team's innovations could reduce the cost of long-term energy storage and therefore enable renewables to be more cost competitive with conventional generation sources.